Canberra cyclists will soon be able to bring their bikes along for the ride more often, with Action buses set to be fitted with bike racks. ACT minister assisting on transport reform Shane Rattenbury says the allowance should encourage more active transport across Canberra. "Over the coming months, Action buses will commence fitting bike racks to all of its articulated and steer-tag buses, meaning 98 per cent of buses will be soon be able to carry bikes, up from the current 84 per cent figure," he says. This should help those who want or need to combine cycling and public transport to get around. "This is great news for the travelling public, who will soon be able to ride part of their journey on a bicycle and part of it on a bus and be virtually guaranteed that the bus will be fitted with a rack," Rattenbury says. "As the articulated and steer-tag buses are frequently used for the key inter-town routes, this will be especially beneficial to commuters. " Only nine buses out of the entire Action bus fleet are unable to be fitted with bike racks. 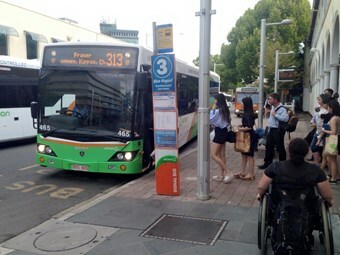 "We have undertaken a comprehensive safety and risk assessment resulting in a change to the previous policy that some Action buses were too long to be safely fitted with the racks," Rattenbury says. "The only buses that will not be able to carry bikes are the short ‘Dennis Dart’ buses – of which there are only nine active in the Action fleet – as they are structurally unable to carry the racks. Even electric bikes can be accommodated, so long as they weigh less than 25 kilograms. "I am also happy to announce improved policies to assist riders of electric bikes," Rattenbury says. Previously, electric bikes were not permitted on Action buses at all. "It is important that we do everything we can to facilitate sustainable travel in this city," Rattenbury says. "Easy interchanging between modes – whether it is bike to bus, or bus to light rail – is a key aspect of this. Public transport providers need to be flexible, willing to adapt and able to accommodate the needs of the community – in order to encourage patronage. "Our young city sits at a crossroads, with rapid growth expected in the next decades," Rattenbury says. "The key is creating a quality public transport system for the future, prioritising active transport modes like walking and cycling."